Dynamic tags are a neat way of adding more sophisticated personalization to your email. Suppose you wanted to send one email design to everyone on your list. However, depending on whether that subscriber is a Facebook Fan or a Twitter Follower, they would see different content. As long as you have a way to differentiate what makes Subscriber A different from Subscriber B in your list data, this type of personalization can be accomplished simply using dynamic tags. 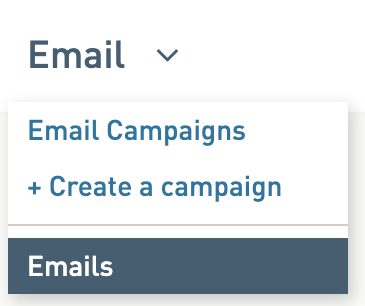 Dynamic tags also allow you to quickly add best practices links like unsubscribe, forward to a friend, and view email as webpage. 1. Go to Subscribers > Dynamic Tags. 2. Copy the Dynamic tag you would like to use. Use your keyboard controls ctrl+C or your browser copy tool to copy the dynamic tag to your clipboard. 3. Open your email design in Modern Editor or your hand-coded email. 4. Paste the dynamic tag into any text block (if designing in Modern Editor). 7. Save your email design. Use Subscriber Preview to test your dynamic tags inside any Campaign. Learn more by reviewing this post. 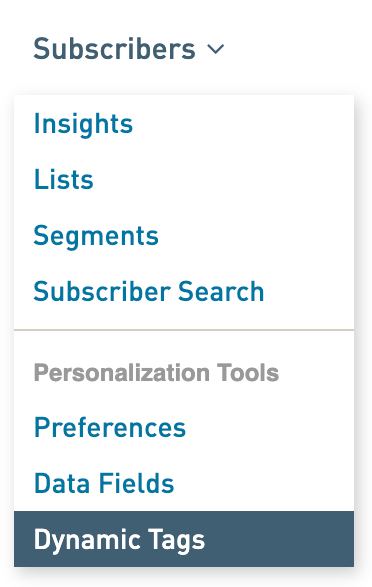 We've put together support posts about all our personalization features.